Organic cotton is increasingly claiming its market share. International clothing labels now offer lines produced with organic cotton and there are new consumers segments which are keen to purchase chemical free and sustainably sourced materials. While the advantages of organic materials are widely accepted on the consumer side, the enormous potential for people harvesting organic cotton is not easily visible. Supporting organic farming in West Africa strengthens the ability of farmers to adapt to a changing climate and leads to increased livelihood resilience. In the West African country of Benin, cotton is the most important cash crop and the main source of income for the rural population in the central and northern parts of the country. But the widespread conventional agricultural practices come with a hefty price tag. Cotton needs more fertilizers and pesticide treatment than staple crops, such as maize, and the fertilizers and pesticides come at a high price, often forcing farmers into debt at the beginning of the agricultural season. If farmers are able to have a good cotton harvest they will be able to pay off their debts and generate revenue, but the big risk is weather-related hazards, such as droughts and floods which can reduce the harvest or even make production impossible. If farmers’ lose their harvests, they may not able to pay off their debts which results in their exclusion from farming co-ops and prohibits them from cotton farming in future. In many cases, the production of cotton therefore comes at the risk of losing livelihood. This risk is increasing as West Africa is increasingly dealing with variable climate. Delayed onset of the rainy season, dry spells, and high-intensity rainfalls put harvests at risks and farmers face increasingly higher economic risks. Organic cotton production can be one promising measure to consider in order to adapt to the variable and changing climatic conditions. The high organic matter content of soils under organic production makes them less susceptible to droughts and excessive rainfall compared to conventional production. Farmers in Northern Benin have observed that organic cotton fields can perform better than conventional agriculture systems under dry spells. Additionally, organic materials are locally and naturally available and do not force farmers into debt to purchase expensive fertilizers and pesticides – which also reduces the risk of losing their livelihoods. Growing crops with little or no chemical input does not make it “organic” per default – farmers need to be provided with information and training on organic farming practices, production of compost, and learn about biological pest controls. The West African certified organic sector lags behind other regions in Africa, though more organic production is believed to take place in the informal sector without certification. It is therefore necessary to invest in the building up of the certified organic cotton production. 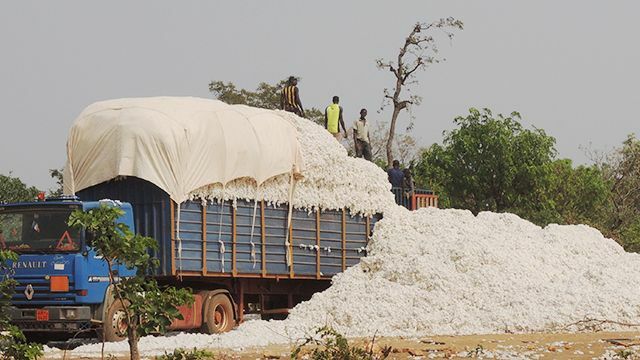 On a global scale the demand for organic cotton is growing, which presents a unique opportunity for policy makers and governments to actively support the slowly growing efforts to market West Africa as a producer of organic cotton. Policy makers need to view organic cotton production as one important adaption strategy to climate change in West Africa and as a potential strong driver of sustainable development. Organic cotton production is particularly attractive to women in Northern Benin, who often lack access to finance as there are very few cash crops which they can cultivate in their region. Since organic cotton production does not require the use of chemicals and can be harvested on less fertile land, women can access this income stream. If successful, organic cotton cultivation allows women to have an independent income that they can allocate without seeking permission from their husbands. They report that this is of great benefit for them and their children, because they can ensure that school fees are paid, they can readily access health care facilities, and the income is usually invested in improved nutrition in terms of food diversity and nutritional value. Earnings are also invested in small animals such as pigs, which can then be sold when cash is needed, buffering them against natural hazards or illness. Through all these effects resilience of the household to climate stresses is increased in the longer run. Women are however generally not entitled to own land which hampers the opportunities that arise for women in organic agriculture. They also do not have the financial means to invest in mineral fertilizers and a lot of time and labor is needed to make soils fertile by purely using natural means. Allowing women to own and access land in the long term could be an important factor to boost the organic cotton production, and enabling them to make small investments in their business. The potential of organic cotton production for female farmers must be recognized at the policy level, especially in the context of a changing climate. Empowering women through organic cotton production will strengthen the overall resilience of households. This blog post is based on the journal article “Organic cotton production as an adaptation option in north-west Benin” which as published in “Outlook on Agriculture” in 2014. The research was conducted as part of the West African Science Service Center on Climate Change and Adapted Land Use (WASCAL) project, which is a large-scale research-focused programme initiated to develop effective adaptation and mitigation measures to climate change. The geographical focus of WASCAL, which is funded by BMBF, is on West Africa with in-depth research in case study watersheds in Benin, Burkina Faso and Ghana.